Paranoid Personality Disorder is characterized by a pervasive and ongoing mistrust of others, particularly without any reason or evidence to support the lack of trust. Paranoids tend to be hyper vigilant toward perceived threats or slights. They are usually isolated and withdrawn because they find it difficult to trust people enough to develop deep and meaningful relationships. Diagnosis is made on the basis of the presence of three or more indicators, including refusal to forgive insults and injuries, constant suspicion of others, tenacious sense of personal rights, excessive sensitivity to rejection, unjustified recurrent doubts and hostility, preoccupation with conspiracies and finding hidden “explanations” for events. Paranoid Personality Disorder is distinct from paranoid schizophrenia, which has different diagnostic criteria. Paranoid Personality Disorder can be problematic to treat, because the nature of the individual’s disorder makes establishing the necessary rapport with the therapist challenging. Frequently paranoid personalities are treated in a group setting; however, success requires the leader to communicate concern and caring, respect the individual’s privacy, and assure they do not perceive themselves being attacked or criticized by the group. Encouraging daily routines and structure provides reassurance to the paranoid personality that their world will not fall apart if they begin to change. Medications are not a primary focus, except as temporary aids, but small doses of antipsychotics, antidepressants, and psychostimulants have been effective for some patients. 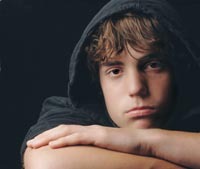 Parents of teens with Paranoid Personality Disorder face a difficult challenge. Innocent questions and actions may be judged to be attacks, and the teen may be both untrusting and unforgiving. In addition to seeking counseling for the teen, the parents may benefit from family therapy to learn new behavioral patterns for interacting with their child.